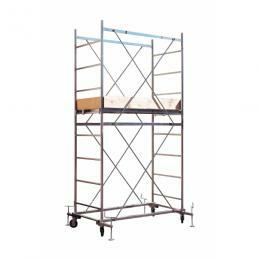 A Gierre mobile tower is the best choice when you need to work at very high altitudes. Mister Worker™ offers the possibility to choose between various models, to be chosen according to the work that needs to be done. 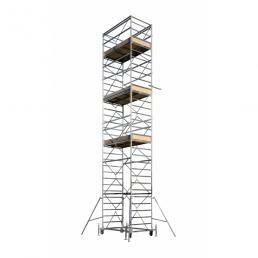 The Gierre mobile towers are highly professional mobile scaffolding, designed to guarantee maximum stability and safety in every situation: it is a strator useful for setting up a construction site, especially if you have to work for many days outdoors and at a high height. The giant Gierre mobile tower, for example, reaches a height of 13 meters and has several solid and robust Eurodeck platforms, each with a hatch to facilitate the transition from one floor to another. It has a quick fixing system with ties with an involuntary anti-slip system, and the wheels have a braking system that makes it a stable and safe structure. There is also the Gierre gigantic mobile tower version, which reaches up to 18 meters in height: it is the ideal structure to choose when setting up an important construction site, because it has a central tie rod that guarantees maximum rigidity and stability even in conditions adverse weather conditions. The surface finish with electrolytic zinc coating prevents corrosion due to atmospheric agents: this guarantees a longer useful life and makes it perfect to be used also for long-term outdoor construction work. When working in the field of construction, a mobile tower Gierre is the best choice: from Mister Worker™ you can find the one that suits you best, and you will be delivered in a short time with regular safety certification.